CAN I TAKE ANXIOUSLESS IF I’M ALREADY TAKING ANOTHER NSP PRODUCT FOR STRESS AND ANXIOUSNESS? 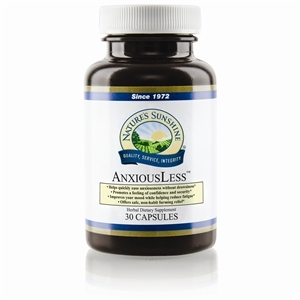 No side effects have been reported from taking AnxiousLess with other NSP products for stress and anxiousness. IS ZEMBRIN A NATURAL INGREDIENT? Yes, Zembrin is a patented, standardized and clinically studied extract of Sceletium tortuosum, a plant that grows in South Africa. It is also called kanna. HOW SOON CAN I EXPECT ANXIOUSLESS TO START WORKING? Most people who have taken this product reported that it works within an hour, however individual results may vary. CAN I TAKE ANXIOUSLESS IF I AM ALREADY TAKING A PRESCRIPTION MEDICATION? As with all nutritional supplements, we recommend that you consult your physician prior to taking AnxiousLess.